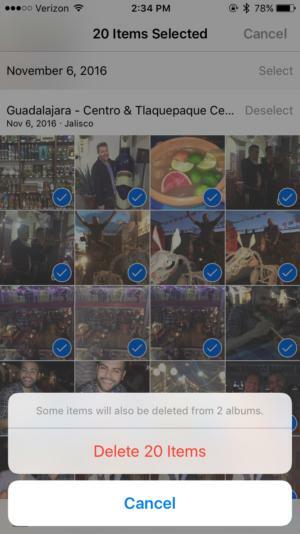 Here are the fastest and easiest ways to bulk delete photos from your iPhone. My iPhone is running out of storage space and I think it’s because I have a lot of photos on it. I’d like to remove them all in one go, after backing them up. Is there a simple way to do that? 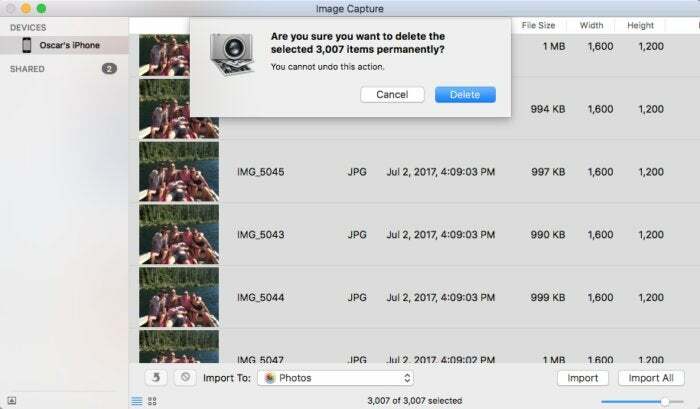 Image Capture may be the quickest way to bulk delete your iPhone images. Alternatively, after you’ve backed up your images you can delete them in batches directly on your iPhone. To do that launch the Photos app, navigate to the Photos tab on the left until you get to Moments view. Then tap Select at the top-right of the screen, and tap each Select link next to each batch of images you want to delete. Tap the Trash button in the bottom-right corner, confirm that you want to remove the images, and they’ll be deleted. You can also delete images in batches from the iPhone's Moments screen. Sooo you need to switch off Photo Stream on your iPhone. To do that go to Settings > Photos & Camera. In the resulting screen flick the My Photo Stream switch to Off. This will cause the pictures to disappear from your phone.